This entry was posted on February 11, 2015 by admin. With Valentine’s Day approaching, do you have chocolate on your mind? You may be wondering if chocolate is sinfully delicious or a healthy treat. The truth is better than you might think! In fact, when faced with a sweet tooth, dark chocolate might be the best indulgence to choose. Could this silky smooth treat quench your craving and provide health benefits too? 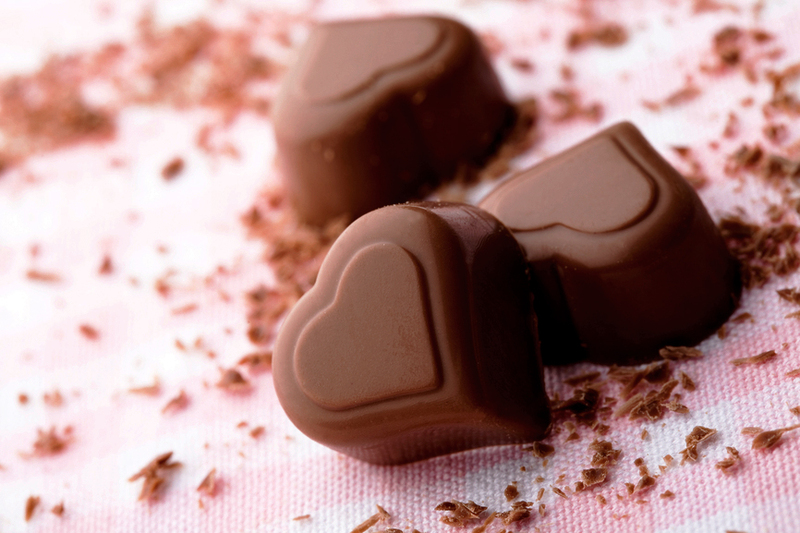 Read on to discover the best reasons to choose chocolate for you and your Valentine. 1. Keep Your Heart Healthy: Eating several squares of dark chocolate each day can decrease the risk of death from heart attack by almost 50%. Research found that people who ate chocolate had blood platelets that clotted more slowly than those who had not indulged. This is important because when platelets clump, a clot can form, and when the clot blocks a blood vessel, it can lead to a heart attack. Further research has suggested that chocolate and cocoa may lower the risk of cardiovascular disease by lowering blood pressure, decreasing LDL oxidation, and providing anti-inflammatory benefits. 2. Decrease Insulin Sensitivity And Blood Pressure: Researchers found that people who ate three ounces of dark chocolate over a 15-day period had a lower insulin resistance (a risk factor for diabetes) than those who consumed white chocolate. Systolic blood pressure, measured daily during this study, was also at a lower level for the group that ate the dark chocolate. 3. Conquer Chronic Fatigue: During a recent study, a group of adults that suffer from chronic fatigue syndrome were given 1.5 ounces of dark chocolate every day for eight weeks. They reported feeling less fatigue after eating the chocolate. In addition, no weight gain was reported. 4. Prevent Memory Loss: Drinking two cups of cocoa a day may prevent memory loss in older people. Different areas of the brain need more energy to complete certain tasks, which is provided by greater blood flow. Cocoa keeps the brain healthy by protecting blood flow in working areas of the brain. 5. Avert A Stroke: One study of over 40,000 people found that people eating chocolate were 22 percent less likely to suffer a stroke than those who didn’t. Furthermore, those who had a stroke but regularly consumed chocolate were 46 percent less likely to die as a result. This Valentine’s Day, show your loved ones you really care by giving them dark chocolate. Look for varieties with at least 70-85% cocoa for the most benefit. Loaded with nutrients, dark chocolate is one of the best sources of antioxidants on Earth! As the health benefits continue to be discovered, you’ll find it readily available on your grocer’s shelves. So drop the guilt and pick up a piece of chocolate to celebrate all the healthy reasons to love this rich, silky treat! Happy Valentine’s Day from your friends at AndsTrim! Our mission at AndsTrim is to provide our customers with the highest quality of all natural supplements, all at affordable prices. We stock only the finest and most effective supplements to assist you in reaching your weight loss goals and overall well-being.